Transit maps from Ball State University Libraries GIS Research and Map Collection (GRMC) and Archives and Special Collections are included in an exhibit at the College of Architecture and Planning Indianapolis Center. The exhibit features maps and student projects showcasing the potential for a light rail transit system from Noblesville to Indianapolis. 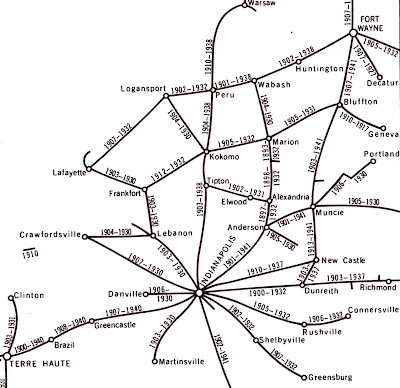 The maps reveal the history of successful mass transit, including interurban routes (shown above), throughout Indiana. 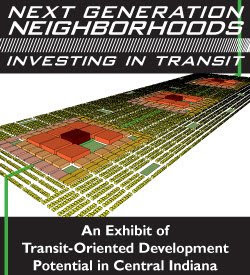 “Next Generation Neighborhoods, Investing in Transit: An Exhibit of Transit-Oriented Development Potential in Central Indiana” can be seen at the CAP Indianapolis Center Exhibit Gallery located in the storefront of the Indianapolis Center at 50 South Meridian Street near Monument Circle. According to the CAP Indianapolis Center Web page, the exhibit “explores how a public investment in rapid transit can leverage private development to renew neighborhoods and commercial districts and develop Central Indiana in a smarter, more cost-effective and sustainable manner.” Students worked on projects showing the potential for development centered around 18 potential light rail stops from Noblesville to downtown. More information about the exhibit is available on the CAP Indianapolis Center Web page at http://www.bsu.edu/capic/index.html. For more information about using maps for a special exhibit or development project, please contact the GRMC at 765/285-1097.